body's healing needs and to initiate changes through a broad spectrum of therapeutic procedures. Kinesiology can be considered as a system of natural health care which combines muscle testing and monitoring with the principles of Chinese medicine to assess energetically a body’s function. A fundamental premise is that the body has innate healing ability and is constantly attempting to correct itself, but sometimes it needs to be helped to achieve this balance. Muscle testing accesses information within the innate memory and subconscious mind to identify the bottom-line causing a malfunction and then a methodology to resolve it. Kinesiology utilizes the body's innate healing intelligence and in doing so, aids the body in its natural drive to restore balance and thus health, to both the neurological and physiological systems. When everything is functioning well in our systems, we feel well and are usually well. The vital process upon which Kinesiology relies is the muscle feedback system and this handy piece of human wiring gives instant access into the Wholistic information held within the subconscious mind/body. The body is usually aware of what it needs to heal. Kinesiology may be able to access the innate information within the body and then aid in the facilitation of the natural healing process. fundamental procedures to investigate and make corrections to the neuro-chemical expression of the brain, body and neuropeptide (information substances) which are responsible for our emotional responses and stress reactions. While emotions are perfectly normal, they sometimes produce behavioural effects which are counterproductive to our health. Emotions such as anger, grief, fear and others can affect us negatively long after the original event that created them. When our body fails to release these emotions we can find ourselves with unexplained aversions, phobias, self-sabotaging behaviours and destructive beliefs, which may create chronic physical health problems. 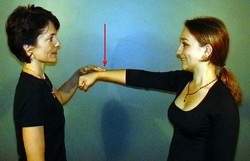 A method approach called Neuro Emotional Technique (NET) can be used to identify, and help extinguish the impeding emotional patterns. If the body’s physiology is out of balance due to inadequate nutrition, physical or emotional stress events and trauma, at any point in our life, our normal emotional responses to a challenging event may not resolve in a natural manner and create a sensitising event that locks into some part of our body system. A subsequent event that mimics the original event will tend to create an automated response similar to the original event. We don’t always recognise the link between the past event and the present situation but the response is felt as if they are the same. These emotional responders do not even have to be created by a real event, as the body will respond the same way to an imagined event of the past, like a nightmare or a scary movie experienced in childhood. A young child’s mind may not rationalise fact from fiction and thereby create a response associated to a visual image which can still be triggered later as an adult. NET can help find embedded, negatively charged emotions captured in your body and then assist in releasing them. The process is quick, none confronting and can dramatically improve your wellbeing. sensitising event has been recognised, a simple correcting procedure is implemented to immediately extinguish the unwanted emotional responder. This then allows the body to self regulate its physiology into a healthier balance. Removing adverse emotional responses greatly supports the process of Psychology in dealing with life’s usual stresses.